Belle Fleur...This florist is a good find...I got a lovely bouquet from here when we first got engaged and have had it on my mind ever since.....they are a mother-daughter team and put out some beautiful bouquets. 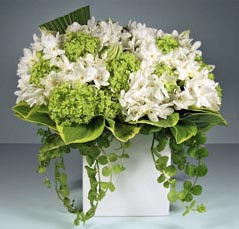 I'll be checking them out along with some other NYC florists.... Belle Fleur: These bouquets are especially beautiful! The florist is the "flower girl"-- (I can't find a website and that always annoys me as I like to check out products and get a feeling and price range beforehand) but regardless, she had some interesting arrangements staged while I was there so I'll give her a call and see what comes of it. Stay tuned for a new feature debuting soon on the blog -- "meet the wedding party" -- it should be a nice (and hopefully entertaining) addition! Stunning bouquets, particularly the different shades of calla lillies! My sister used Belle Fleur for her wedding 3 years ago and was incredibly happy with everything. My vote is for them. I am engaged myself, but my wedding is in LA they don't design destination weddings. thanks Sabrina! Love to get tidbits like that!!! Good luck with your wedding planning! !